By advances in globalization, a lot of goods; industrial products, materials, electric parts, devices, food, water, etc., trade all over the world. To guarantee the quality of these trade goods, the instrumental analysis is an indispensable technology. It is important to share the technology concerning the instrumental analysis between the exporting and importing countries. PAI-NET supports international technological exchange concerning the instrumental analysis. 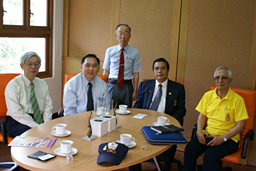 We have contracted the Agreement for promoting academic instrumentation analysis between Chulalongkorn University,Thailand and PAI-NET at May, first 2007.